Sermon Leftovers: You can get out from under that cloud of gloom! Joel, the prophet, called on the nation of Israel to repent. Chapter two of his writings paints a frightening picture of the impending doom his countrymen faced. He predicted the advance of a powerful attacking army such as had never been seen before. He described those days as dark, cloudy and gloomy. But he also reminded Israel that their God was still able to save them. 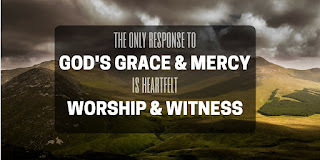 “Even at this late hour” he said, “When things look so bad, our God can still save the day.” He reminded his friends that God is gracious, merciful, slow to anger, abounding in steadfast love and One who relents from punishing. The prayer Joel prescribed for Israel can also be prayed by you. You may not face an advancing hoard of Assyrians, or locusts, or a famine. You may however find yourselves in dark days, living under a cloud of gloom. Perhaps it is time for you to turn back to God, your Father and allow Him to step in and save you. Use the prayer of Israel as a template of your own repentance. Let your repentance be a promissory note to repay God’s mercy and grace with your own public worship and witness.